Since the press release below was written Cutlass has been confirmed as overall winner of the 2009 Bermuda 1-2 on elapsed and corrected time. Alex Mehran and Nick Halmos’s Owen Clarke Class 40, Cutlass has crossed the line first on the return leg of the Bermuda 1-2, in the same convincing manner as she won the first leg out to Bermuda. In the last 24 hours the lead boats suffered sustained head winds of 30-35 knots with gusts of up to 50knots and three metre seas. Her closest competitor also happens to be an OCD Class 40, Dragon, skippered by Mike Hennessy, who until the last night had held a strong easterly position only 10 to 20 miles from Cutlass. Dragon is yet to finish but is currently placed second and as this release is written it looks like Mike Dreese’s production Akilaria Class 40 will take third place ahead of the rest of the fleet, but more than twelve hours behind the winning boat. Cutlass finished leg 1, second on PHRF corrected time and we will wait to see the final results of the second leg and whether she has won leg 2 and/or the race on corrected time. If Alex and Nick achieve this elapsed leg and corrected time win they will emulate the performance of the OCD Open 50 Artforms crewed by Kip Stone and Merfyn Owen in the 2005 event. Cutlass and Dragon are semi-customised sister-ships built at different yards. 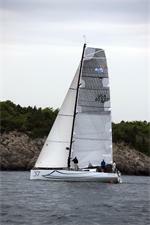 Cutlass is the ex 40 Degrees, the Class 40 champion in 2008 and was built at Jaz Marine in Cape Town, South Africa. Dragon on the other hand was built and launched last year in the UK at the Totnes based yard of Composite Creations. The next time these two boats and the other Class 40’s race will be on July the 5th from Marblehead, USA to Halifax, Canada. On this occasion, designer Merf Owen will be taking part in this race for the second time, crewing on Dragon and hoping to help turn the tables on the Cutlass boys and beat the rest of the fleet of course.